Data0.Net Security Blog: DontPhishMe help you prevent from web phishing on Mozilla Firefox. 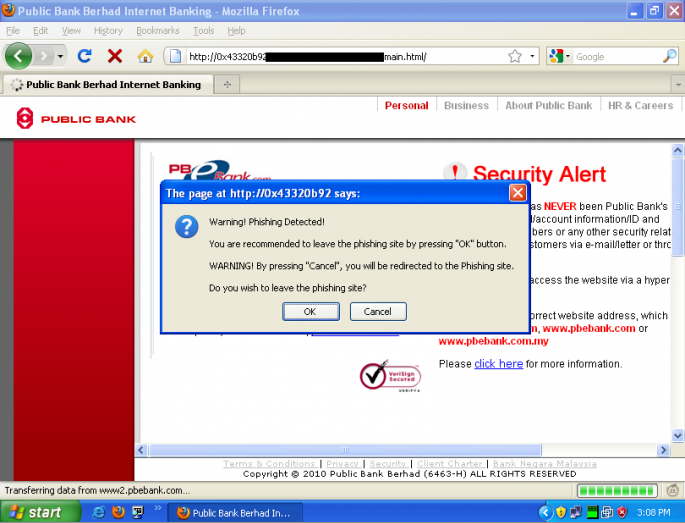 DontPhishMe help you prevent from web phishing on Mozilla Firefox. DontPhishMe is an initiative of MyCERT, CyberSecurity Malaysia, to provide a security mechanism in preventing online banking phishing threat specifically for local Malaysian banks. DontPhishMe is an addon to Firefox that alerts you if an online banking web page that you visit appears to be asking for your personal or financial information under false pretences. This type of attack, known as phishing or spoofing, is becoming more sophisticated, widespread and dangerous. That's why it's important to browse safely with DontPhishMe. DontPhishMe will automatically warn you when you encounter a page that's trying to trick you into disclosing personal information. New version has been release yesterday (7 June 2010) . To download and install click DontPhishMe banner above or click here!.